Despite beings scattered, predictable, and somewhat bland, I laughed a few times. Peter's gag about rearranging the letters in the name of producer Cherry Chevapravatdumrong was pretty great, and it was the kind of unexpected fourth-wall-breaking humor that Family Guy used to excel at. It felt like a flash of the show's earlier, pre-cancellation greatness. 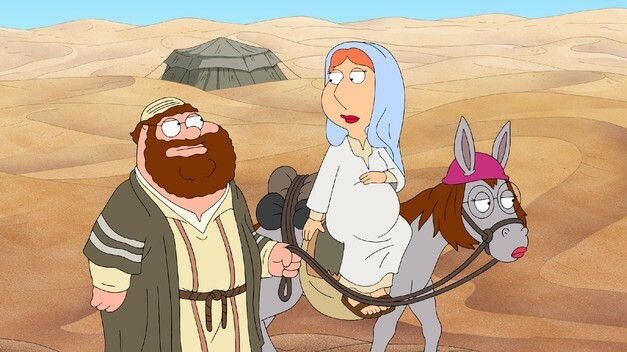 Stewie's remark that Jesus lived with the Griffins for a week may have been the most honest thing the show had to say. It called into question the entire point of the episode, as well as reminding viewers of the better episodes of the past. That episode, season seven's "I Dream of Jesus," had more to say about Christianity and religion, and in fact helped launch the show its Emmy nomination for "Outstanding Comedy Show." There were some pretty good one-liners. I liked the joke about "Dial IX-I-I," and the mock trailer for an Adam Sandler movie called "Ben Him/Ben Her" was solid. Even though I raise an eyebrow at the scene of Family Guy making fun of Adam Sandler movies, that was dead on target. What really saved this episode, however, was the scene at the end where the Griffins turn away a desperate young pregnant couple, with extreme prejudice. Peter's grim "I'm getting the baseball bat" was just the dollop of cynicism that this episode needed.